﻿ Portwell Releases A Compact Com Express Module Equipped With 5th Generation Intel® Core™ Processors- Portwell, Inc.
Portwell, Inc., (http://www.portwell.com.tw) a world-leading innovator in the Industrial PC (IPC) market and a Premier member of the Intel® Internet of Things (IoT) Solutions Alliance, today announces the release of the PCOM-B633VG, a Type 6 COM Express Compact (95mm x 95mm) module based on the 5th generation Intel® Core™ processor. The COM Express module delivers optimized value models and service levels by running multiple applications securely and reliably on virtualization-optimized platforms. Along with three symmetric independent displays, the PCOM-B633VG also employs the 5th generation Intel® Core™ processor, built on 14nm process technology resulting in performance and excellent energy efficiency. PCOM-B633VG also offers pin-to-pin compatibility and scalability from previous platform designs (4th generation Intel® Core™ processors) to support legacy and new retail applications with excellent performance at low power. These features are designed to reduce manageability cost and improve security, making the PCOM-B633VG an ideal solution for Medical Healthcare systems, Digital Signage and Retail systems. The compact PCOM-B633VG COM Express module supports up to 8GB DDR3L 1600 MT/s SDRAM on one 204-pin SODIMM socket and optional 4GB DDR3L memory down making it very fast. Expansion capabilities embrace a PCI Express interface with controllers integrated into the processor for excellent video performance and enhanced capabilities to be configurable to 1 x4-lane, 2 x2-lane or 4 x1-lane ports. The module supports three independent displays -- DP (DisplayPort); HDMI or VGA; and LVDS -- with fast 3D performance. Portwell's customers know they can always count on us to provide them with a quality product and long-term support with up to date know-how. Designed on a basic 95mm x 95mm platform, the PCOM-B633VG is backward compatible and can seamlessly scale up to ensure interoperability between industrial edge devices and the enterprise. Meanwhile, Portwell customers are able to manage certification more easily thanks to generational compatibility. In the Medical and Automation sectors, safety with accuracy and precision are paramount, while in the Digital Signage and Retail market, safeguarding investments by lowering costs of future designs is the status quo. As the markets change, Portwell's versatile COM Express modules adapt to these changes by enabling designers to partition commodity host-processors from proprietary baseboards, thereby helping to minimize current and future design risks during the initial phase of development. This design of separating the CPU-upgradable module from system specific I/O carrier boards further safeguards development investments and is designed to lower total cost of ownership. In addition, Portwell can also provide services to clients on the carrier board design and development, review schematics and BIOS customization. At Portwell, we strive to create superior products for our customers. 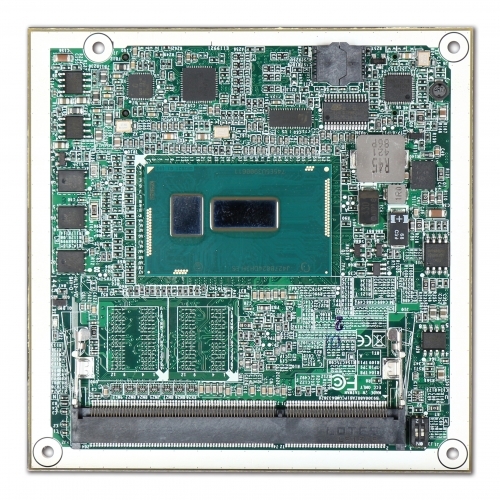 Portwell PCOM-B633VG is designed with Intel® Broadwell-ULT CoreTM i7/i5/i3 ultra low power processor with turbo-boost, SOL, IDER, iAMT 10.0 remote control which offer high speed and accurate responses suitable for medical healthcare systems and military seeker.